I love this cute retired Stampin' Up! Set "Happy Camper", but I must admit it has never seen much ink. I finally pulled it out of my cabinet and blew the dust off it because I needed yet another guy's card and I did not want to color in one more picture of a deer. Oh, how I wish the guys around here had more interests other than hunting and football! To make my card, I first cut a circle with Spellbinder's Nestabilities using Soft Sky card stock. I then hand cut some grass using Wild Wasabi card stock and stamped the camper image in black ink directly on both pieces of card stock. 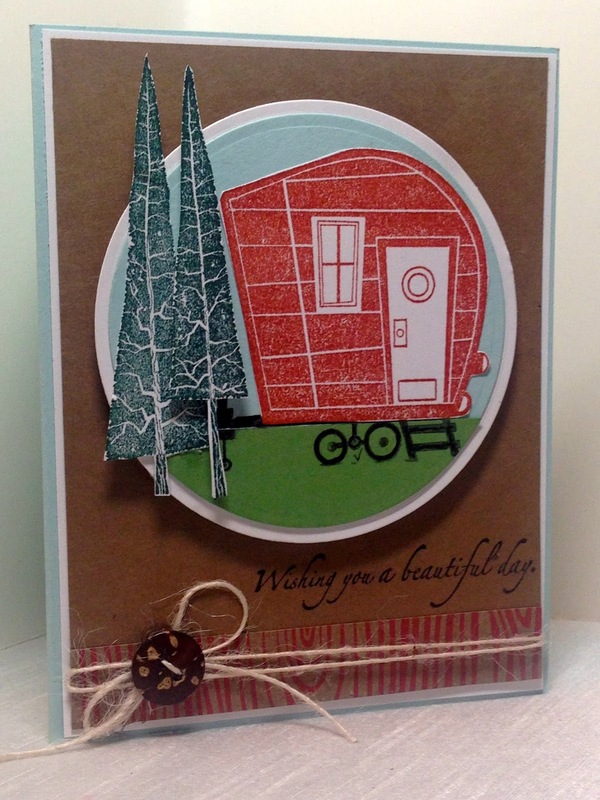 I then stamped the camper again in red ink on a separate piece of white card stock and cut just the camper itself out and adhered it to the Soft Sky base. The trees were also stamped and cut out separately, then popped up on dimensionals onto the main image base. The sentiment is from retired Stampin' Up! "Beautiful Beach". I cut a second larger circle using Spellbinder's Nestabilities with white card stock, and popped up the entire panel with dimensionals onto a craft base. I used a tiny bit of designer paper from DCWV "The Printed Kraft Stack" on the bottom of the card. A button and hemp were used for embellishment. The entire front was then adhered to white card stock, and then attached to a Soft Sky card base. Hope you're having a good week, lady! This is adorable!!! Love the double layering of the circles and the touch of wood grain paper at the bottom. Great card!! Super ! love the theme of this card ! fab design ! Love the card. Love the red trailer---reminds me of the trailers in cartoons when I was a kid.